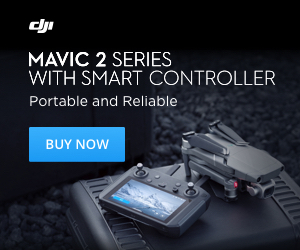 DJI has singlehandedly monopolized the enthusiast and professional drone niche. That said, with literally dozens of drones available, deciding between ​the different models can be challenging. 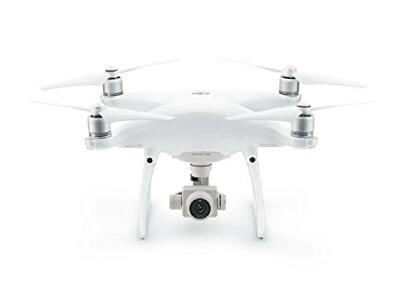 Then you also need to factor in DJI’s annual release of new drones. Each year the differences become less apparent, and you need to dig deeper into the specifications to find out why one is cheaper than the other. As always the drone you choose will depend on how you intend on using it. Fortunately, for you, we’ve put together a comprehensive DJI Mavic Pro Platinum vs DJI Phantom 4 Pro comparison. Our goal is to provide you with every bit-on information needed to make a decision. However, read through to the end for our final verdict on which done we’d choose if we were you! ​When deciding between the Mavic Pro Platinum or Phantom 4 Pro, the camera can often be the most important factor. Let’s start with the Phantom 4 Pro which has by far the best camera of the two. Its 20 megapixels, 1” CMOS, with a mechanical shutter capable of producing bright and professional looking photographs, is easily ahead of the competition. The larger sensor is what contributes to the camera’s excellent low light performance with an up to 6400 ISO. A higher ISO obviously means better low light shots. The Phantom 4 Pro’s camera also shoots video in 4K at 60 frames per second, ​making it ​​​a no-brainer for ​videographers looking to shoot ultra-HD in slow motion. Then there is also the fact that the Phantom 4 Pro shoots in H.265 which is a big help for pros who want to clean up their footage in post-production. The Phantom 4’s camera also stands out in FOV (field of view), with a much wider aperture compared to the Mavic Pro. 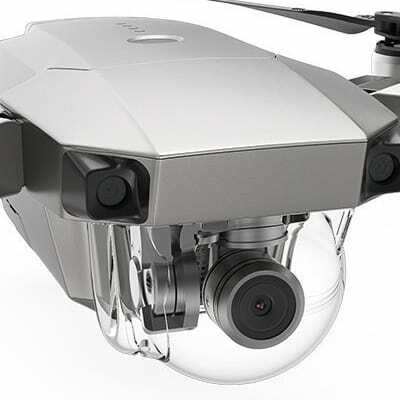 The Mavic Pro Platinum, on the other hand, has what appears to be a slightly inferior camera with a 1/2.3” CMOS sensor​ capable of shooting 12-megapixel ​photographs. The Mavic Pro Platinum shoots in 4K at 30 frames per second, ​which ​​​perhaps not as good as 60 fps but it is still silky smooth. However, if you want to shoot at 60fps simply drop the resolution to 1080p, which isn’t a big deal for casual users. Taking low light shots is also going to be challenging since the Mavic Pro Platinum only shoots at a maximum 3200 ISO. Now that isn’t bad, but it just isn’t as good as the Phantom 4 Pro. Both the Phantom 4 Pro and the Mavic Pro Platinum have cameras mounted on a 3-axis gimbal​ ​​and are​ both able to shoot in RAW. The other thing that’s worth nothing is that both the Mavic Pro Platinum and the Phantom 4 Pro don’t have fixed focus lenses. What this means is that you can tap on a specific part of the image and the camera will focus on it. Now the adjustable focus can be great in some situations and bad in a few others. The good thing is you can focus closer on subjects and blur out the background slightly similar to a DSLR. Both the Mavic Pro Platinum and the Phantom 4 Pro have an external storage port for an SD card that can store up to 64GB of footage. ​The DJI Phantom 4 Pro wins in the camera department. ​The Camera on the DJI Phantom 4 Pro is clearly larger, and so it isn’t as portable as the Mavic Pro Platinum. ​Both feature the very same 3-axis gimbal to ensure steady shots in all types of weather. Related Reading: DJI Spark VS Yuneec Breeze: Which is Better? On Paper the Mavic Pro Platinum and the Phantom 4 Pro have very different battery sizes and capacities. The Mavic Pro Platinum is powered by a smaller, 2970 mAh battery while the Phantom 4 Pro is powered by a much larger 6000 mAh battery. However, even though the Phantom 4 Pro has a 2x larger battery, both of these two drones feature a 30-minute flight time​. ​This is by far one of the best on the market and you'll struggle to find any drone capapable of flying for this long. ​​If you are serious about flying ​I would always recommend carrying around a spare battery or two as this will double or treble your time in the air. 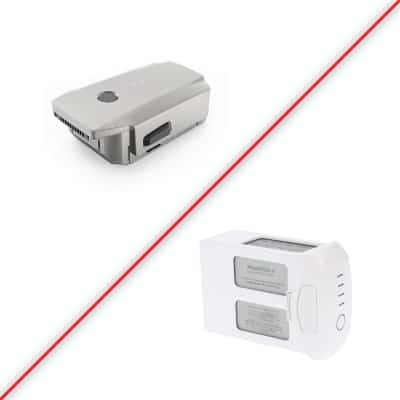 Fortunately, for Mavic Pro Platinum owners, their batteries are a lot smaller, and so they can pack half a dozen without worrying about the added heft! The flight distance between the Phantom ​4 Pro and the Mavic Pro Platinum is ​the exact same, however the two drones utilize different connection methods. The Mavic uses what’s called ‘OcuSync technology’, which means that the drone be flown up to 7km without losing its signal…the dreaded beep! The Phantom 4 Pro uses the older Lightbridge technology, which was unmatched when it first introduced but has been bested by the new OcuSync. Perhaps the biggest problem with the Lightbridge is its latency and interference. This translates to dropouts and lag over a larger distance. While you can fly up to 7km with the DJI Phantom 4 Pro, it is not as pleasant. Now first-time drone pilots may not notice this, but after you’ve flown the Mavic Pro Platinum, it's pretty hard going back to the Phantom 4 Pro’s Lightbridge technology. Interestingly you’re not supposed to be flying a drone out of your line of slight. That said 7km isn’t too far, and so you should still be able to see both drones even at max distance. 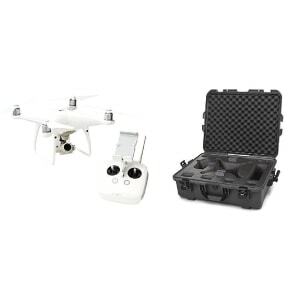 The DJI Phantom 4 Pro and the DJI Mavic Pro Platinum have drastically different designs, with the DJI Phantom 4 Pro is hands down the larger and heavier of the two drones. The Phantom 4 weighs 468g, which is nearly twice the weight of the Mavic Pro Platinum’s 240g. Unfolded the Mavic measures 198×83×83mm which is again 2x smaller than the Phantom 4 Pro’s 289.5 × 289.5 × 196 mm size. 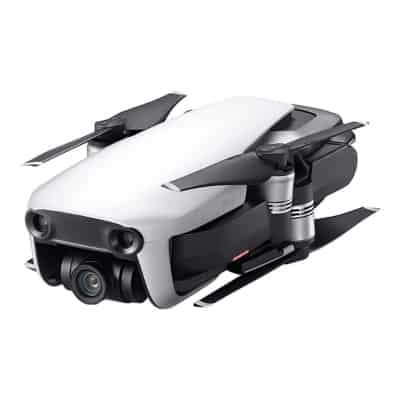 What’s more is the fact that the Mavic Pro can be folded into a 305×244×85mm small package but the DJI Phantom 4 cannot! The Phantom 4 Pro isn’t just larger it is also noisier than the Mavic. However, the Phantom 4 looks more striking with its bright white color while the Mavic is rather subdued. In the durability department, both the Phantom 4 and the Mavic Pro Platinum are built to last. However, don’t expect it to withstand being rammed by a truck! Now there are quite a few reasons why you may want to consider a drone’s speed. While shooting aerial videos, you might want to follow a particular fast-moving object like a car, or motorcycle. So, you obviously need a drone that can keep up to get a good shot. The other reason is perhaps you want to take up drone racing. You may also want to enjoy the exhilarating experience associated with flying a fast drone with FPV goggles strapped on. The good news is that both the Mavic Pro Platinum and the Phantom 4 Pro have different speed modes from which to choose. The Mavic Pro Platinum can reach a top speed of 65 kph in sport mode, but that can be stepped down to 36 kph in p-mode. The Phantom 4 Pro is slightly faster with a top speed of 72kph in sport mode but can be stepped down to 50 kph in p-mode. All DJI drones have one thing in common, i.e. they come packed with a number of intelligent flight modes. Sure some have more than others, but they are still way more than you’ll need. ​This awesome video will walk you through the different flight modes present on DJI drones. 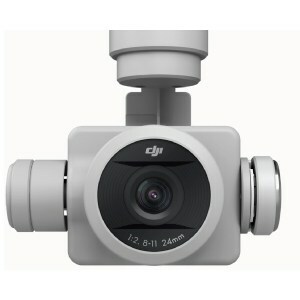 DJI also continues to introduce flight modes with almost every new update. So, the number of intelligent flight modes are not set in stone. Check the patch notes of all the latest updates to see if they’ve introduced new light modes. Both drones come equipped with some of the best obstacle avoidance systems in the industry. However, the DJI Phantom 4 Pro ​has 5 directional sensors, as opposed to the Mavics only forward facing sensors. The Mavic and the Phantom 4 Pro are both capable of identifying railings, rocks, and other obstacles when commencing landing procedures. So, you don’t have to worry about it landing in a pond! Also, both drones tend to take pictures of the ground when you first take off. Those pictures are used to improve landing accuracy, especially when using the ‘return to home’ feature. As mentioned above the Phantom 4 Pro takes things one step further with an array of infrared sensors on the sides and the back. These sensors give the drone a 360-degree view of all surrounding obstacles. The inclusion of these sensors enables the drone pilot to fly backward, sideways and forward more confidently. ​Also, the Phantom 4 Pro is 16 kph faster when you turn on obstacle avoidance, which is a nice little touch. The DJI Mavic Pro Platinum is outright the cheaper drone compared to the Phantom 4 Pro. What you end up paying will vary greatly depending on current deals being offered by the store you choose. 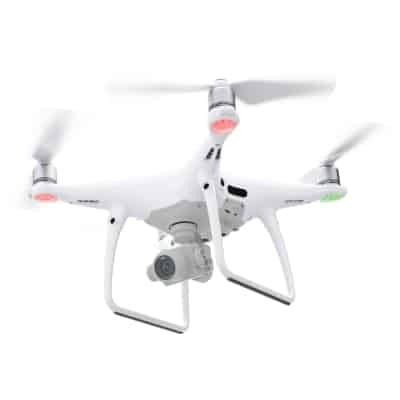 However, generally speaking, you’ll be paying around 15% to 20% more for the DJI Phantom 4 Pro. You can also choose to buy these drones on their own or the ‘Fly More Bundle,’ the latter of which costs more, but you also get everything needed to get the most out of the drone. Personally, I’d pick the bundle! ​Whether you buy the DJI Phantom 4 Pro or Mavic Pro Platinum, some accessories are always a great idea. These aren't strictly necessary,​​ but it sure helps to have some accessories. Check them out below! 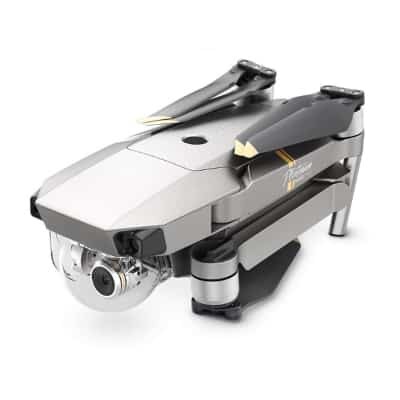 There is a possibility that you have now figured that neither the Mavic Pro Platinum or the Phantom 4 Pro is what you really want or perhaps you want something cheaper. 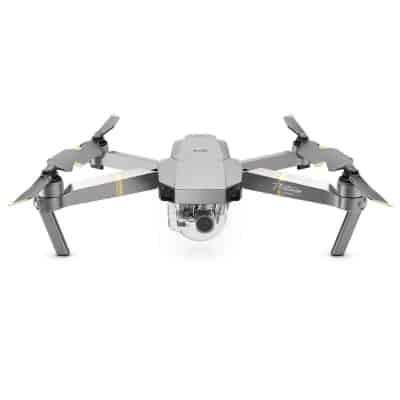 The Mavic Air boasts of excellent 4K video recording, a 12 MP camera mounted on to a sturdy 3-axis gimbal and an updated obstacle avoidance system. DJI has also increased the onboard storage to 8GB and the fact that like the Mavic Air Pro, this one also folds and fits into your jacket pocket. 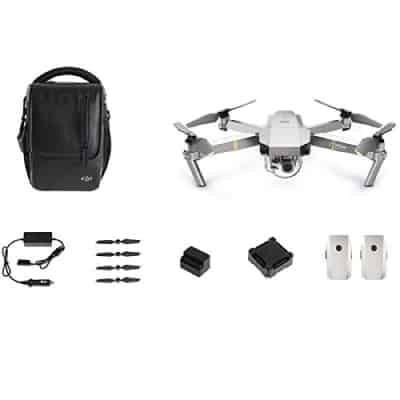 The Mavic Air is also a few hundred dollars cheaper than the Mavic Air Pro. Yet still offers 21-minute battery life, and 32 MP panoramic shots. If you think that both the Mavic Air Pro and the Phantom 4 Pro are beyond what you want to pay for a drone, then consider the Mavic Air. The Mavic Pro Platinum and the Phantom 4 Pro are both excellent consumer grade drones. 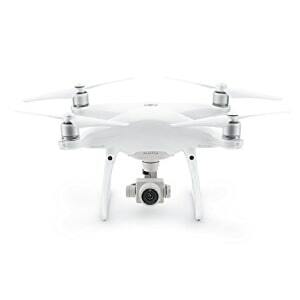 However, the Phantom is angled towards professional photographers who want to take higher quality aerial video and still shots. The larger CMOS sensor and the overall larger camera make shooting in 4k at 60 frames per second a breeze. Though the Phantom Pro isn’t as portable as the Mavic. So, which drone is best for you? 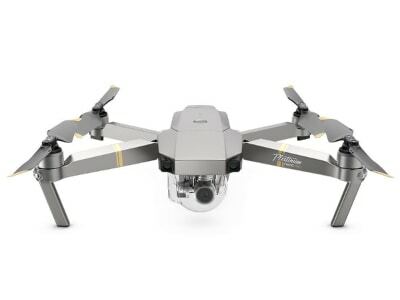 Well if you want portability, decent picture quality and access to a long list of features, then you can’t go wrong with the Mavic Pro Platinum. However, if you want the best 4K videos, excellent still photos and portability isn’t an issue then the Phantom 4 Pro is the undefeated champion.